Do you ever have high cellphone data bills? Do your kids (if they’re of cellphone-using and surfing age) ever have high cellphone data bills? Do you ever want to cut down your data bills, or stay within your bundle? Are you or your kids who are on pay-as-you-go plans, and need to stay within budget? Do you want to monitor how much data your kids are using, and on what? If you nodded your head to any of these questions, then read on, as there is something that could manage your cellphone data costs, and probably leave you happier, with more money to spend on nail polish, lipstick or shoes (this is where my extra money would probably go). Don’t get lost in the jargon, but a normally your phone loads data on websites and apps uncompressed which not only uses more data but can also be slower to download, particularly if you don’t have good reception. 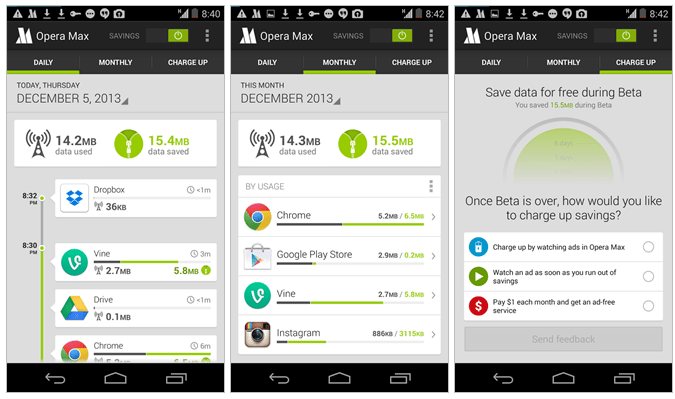 There’s a cool new app called Opera Max which solves these problems by compressing the data from your favourite sites and apps first, so you use up to 50% less data to access the same sites and apps and load them faster. This will even work on wi-fi, if you connect to wi-fi at home or at the office. What’s more, in case you ever wondered where all your data was going, you can check which apps are using up your data and even block data-hungry apps if necessary. You can do this on your kids’ devices too, plus older children can manage their budgets by not going over their data limit each month. Opera Max is currently only available for Android on the Google Play store but watch this space for versions for other devices.